Are you looking for a fun toy for kids which can be used in water or in the sand? The sand and water table set is all you need! It is made from a premium quality plastic material which is durable and long-lasting. Hence your kids can play as they want without worrying about breaking it. The kids' water and sand table include 21 various accessories which help to play in a better and more interactive manner. The accessories also include the flag, water cans, and beach tools. The tools can also be used for digging for fun play. 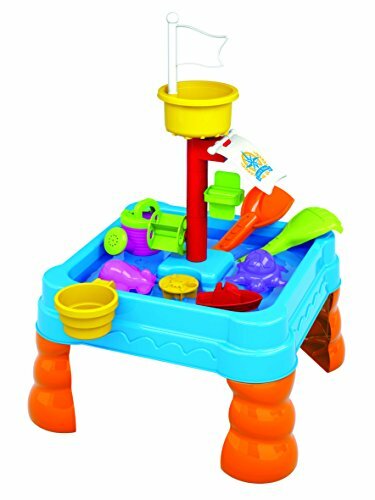 This toddler water table and sand table toy set can be used both in water and in the sand and it won't damage at all. it can also be used indoor and outdoor and provide health entertainment to your kids in this era of tablets and mobiles. This water table is lightweight and hence very easy to carry! It only weighs 2.5 lb and the legs are detachable which lets you easy to carry anywhere. Premium Quality: The water table for kids is made from premium quality plastic and highly durable. You don't need to be worried as it is long lasting. Can Be Used in Water and Sand: This children water table can be used both in water and sand. It provides a fun time for your kids near a beach or even at home. 21 Accessories: The sand water play table includes 21 accessories for water and sand play. It includes the flag, beach tools, and water cans. Your kid will be happy playing with all these accessories and they will have nice play time. Lightweight Easy to Carry: The toddler sand and the water table is lightweight and hence very easy to carry. It only weighs 2.5lb and the dimensions are 14 x 14 x 9 inches. 100% Guaranteed! The water and sand table for kids is 100% guaranteed! Your kids will love it. However, if you face any issue then let us know and we will resolve your issue. If you have any questions about this product by Lenoxx, contact us by completing and submitting the form below. If you are looking for a specif part number, please include it with your message.